APR015 CHINESE WOOD LACQUER GURI TSUISHU. FLAT STAND MARKED. USA, Canada, Oceania, Middle East. They have age appropriate flaws. Asia 90.00 -. CONDITION GOOD;MINOR AGE WEAR(SEE PICTURES).29.5"L x 15"H x 14" DEEP.WEIGHTS 26 LBS. Inside the box, there is a velvet or soft felt lining. 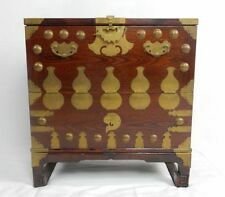 The bottom edges are footed with a hand carved decorative wood painted gold which is screwed into the base. Weighs almost 11 lbs. Height: 34 cm, width: 25 cm. In my collection of everything is the low price and perfect. Materials:Wood Painted. the item must be in it's original condition. 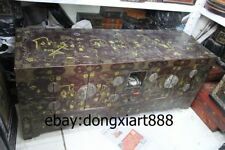 Set of 3 nesting Camphorwood Oriental boxes. Dispatched with eBay delivery – Shutl 2-3 days. Do not worry! Also note that monitor settings may vary from computer to computer and may distort actual colors. Norway，Italy. Belgium, Czech Republic, Spain, Ireland, Poland, Portugal, Russia, Sweden, Turkey, Ukraine. Also note that monitor settings may vary from computer to computer and may distort actual colors. do not worry! Norway，Italy. Belgium, Czech Republic, Spain, Ireland, Poland, Portugal, Russia, Sweden, Turkey, Ukraine. Carved Camphor Wood Miniature Chest nice condition as shown in photos a few slight marks as per photos Attractive little chest make good Jewelly box .30 cm wide 19 cm high 19 cm front to back . Handmake Camphor wood table. The top is made from a whole piece of wood. The wood is covered by Tung oil. Location in Southampton. the thickness of top: 3.8 cm. length=137 cm. Height: 16 cm, width: 19 cm. Carved with boats, trees, clouds, etc. Top lifts out by 2 tab handles. Size: 14.25" width x 15.25" height x 8.25" depth. It weighs 8 lbs. Also note that monitor settings may vary from computer to computer and may distort actual colors. Norway，Italy. Belgium, Czech Republic, Spain, Ireland, Poland, Portugal, Russia, Sweden, Turkey, Ukraine. 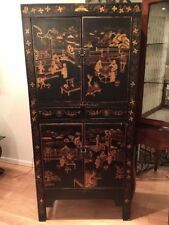 It has carved celadon jade hardstone oval inset panels on the doors and sides and a lower drawer also with jade panels. The interior with four drawers lined in red and white silk fabric. It is in good condition but the hinges on the doors have been replaced and there is no lock on the doors. 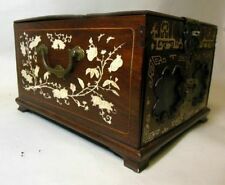 THIS IS A VERY UNIQUE BEAUTIFULLY HAND CARVED, DOVETAILED SILVERWARE CHEST THAT ANYONE WOULD BE PROUD TO DISPLAY. 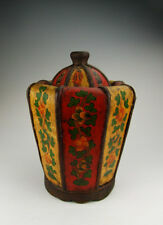 (STOKES) THIS COULD BE COVER WITH AN ENGRAVED BRASS PLATE FOR THE CURRENT OWNER IF SO DESIRED. Today we are offering a rare pig-skin covered Chinese travel trunk/chest in a diminutive size. Measures 13" w x 6" h x 7 1/4" d. Pigskin surface is hand painted with domestic interior scenes featuring a couple, room, veranda and trees. There is wear to the painted surface and losses in areas. Decorative brass front plaque & hasp, decorative side bale handles. Skin is attached to the box with stitches along the edge of the lid. Interior is lined with blue fabric and marked "Made in China". We are dating this piece to the early 20th century -- 1920s. Please see detailed condition description above and take a look at all photos. A nice size and a lovely addition to your Asiana collection!. Height: 36 cm, width: 23 cm. 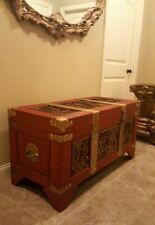 Authentic 1970's Chinese Red Lacquer Trunk/Chest Brass Hardware 24" x 12" x 13"
Offered is this guaranteed Authentic 1970s Chinese Red Lacquer Footed Trunk/Chest with Ornate Brass Hardware Purchased in China in the 1970's and shipped back to the USA It is 50 plus years old, great decor item There is a full size tray that lifts out, inside is in excellent condition Overall for the age in good condition, there is a slight separation on back left corner and a mark on top left hand side, part of the lock is broken but available for buyer. Some other minor blemishes but overall very nice PLEASE LOOK AT PICTURES This is a heavy large package, shipping will be calculated accoring to your zip code Shipping insurance is included This is offered with no reserve. Payment is required within 1 days of end of auction after that eBay will take over and automatically open a non payment claim and collection is then out of my hands. We aprreciate your understanding. We look forward to serving you again in the near future. I have seen two of these. Both were nearly identical to mine. I was told it was likely from the 1700's from China and was used to transport item while traveling. Again the above information is from the research I have done and I am not certain on the age, origin, purpose, etc. I must glad to resolve it friendly. Goods without item number will NOT be accepted. We are very willing to accept everything. and I will do my best to help you to solve the problem by communication. Good condition though no doubt old. Also note that monitor settings may vary from computer to computer and may distort actual colors. If you buy.